Some Words of Wisdom From Fisher Ames | What Would The Founders Think? Fisher Ames was one of the most eloquent orators of his time. He served in the Massachusetts convention that ratified the Constitution and was strong advocate of Federalist principles. He also served in the first United States Congress and subsequently for 3 more terms. 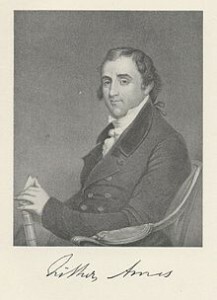 In total he represented Massachusetts from March 4, 1789 to March 3, 1797. But even before his public service, the young Ames knew how to turn a phrase. The following is an excerpt from an essay he wrote while Massachusetts was struggling with the Shays’ Rebellion in 1786, prior to the Constitutional Convention*. Every individual has a right to tell his rulers, I am one of the parties to the constitutional contract. I promised allegiance and I require protection for my life and property. I am ready to risk both in your defence. I am competent to make my own contracts; and when they are violated, to seek their interpretation and redress in the judicial courts. I never gave you a right to interpose in them. Without my consent, or a crime committed, neither you, nor any individual, have a right to my property. I refuse my consent; I am innocent of any crime. I solemnly protest against the transfer of my property to my debtor. An act making paper, or swine, a tender, is a confiscation of my estate, and a breach of that compact, under which I thought I had secured protection. If ye say that the people are distressed, I ask, is the proposed relief less distressing? Relieve distress from your own funds; exercise the virtues of charity and compassion at your own charge, as I do. Am I to lose my property, and to be involved in distress, to relieve persons whom I never saw, and who are unworthy of compassion, if they accept the dishonest relief. If your virtues lead you to oppress me, what am I to expect from your vices? But if ye will suffer my life to depend upon the mercy of the MOB, and my property upon their opinion of the expediency of my keeping it, at least restore me the right, which I renounced when I became a citizen, of vindicating my own rights, and avenging my own injuries. While Ames was addressing a weak government, incapable of protecting private property from the mob, his words could just as easily refer to today’s administration, seeking to redistribute wealth under the guise of “fairness” through the legalized plunder that Bastiat1 referred to 50 years later. 1But, unfortunately, law by no means confines itself to its proper functions. And when it has exceeded its proper functions, it has not done so merely in some inconsequential and debatable matters. The law has gone further than this; it has acted in direct opposition to its own purpose. The law has been used to destroy its own objective: It has been applied to annihilating the justice that it was supposed to maintain; to limiting and destroying rights which its real purpose was to respect. The law has placed the collective force at the disposal of the unscrupulous who wish, without risk, to exploit the person, liberty, and property of others. It has converted plunder into a right, in order to protect plunder. And it has converted lawful defense into a crime, in order to punish lawful defense.